SKYPE the Vows: New technology like SKYPE and Facetime can be a bride’s best friend. Have a guest close to the family seated in the front row where they can unobtrusively and easily set up an ipad or smartphone in a place where that family member can watch vows exchanged in real time. Pop in for a Visit: In the days or weeks following the wedding, dress up in your gown and tuxedo and make a special visit to a loved one – taking a centerpiece, program, favor and maybe even a slice or the top of your wedding cake. Have a special toast just for them and fill them in on all the fun details without making them feel guilty they couldn’t be there on the actual wedding day. Toast from Afar: Could the Best Man or Matron of Honor not attend at the last minute because a baby was on the way or they had a death in their family? Is Grandpa unable to offer a blessing in person because he can’t get around well enough to attend the party? Have them send a video or audio-recorded speech to be played at the reception. Family Dance: When a parent has passed, incporporate a family dance into the reception in lieu of the more traditional father/daughter or mother/son dance. Have different members of the family all join the bride and groom on the dance floor. Pick a song that brings happy memories for everyone as a family. Candles: Lighting a candle as part of the wedding ceremony is a timeless and traditional way to remember family or friends that have passed on such a special day. Flowers: Incorporating a single white rose or bloom that brings happy memories of a loved one into your bridal bouquet or wedding flowers can be a private touch that brings a smile of rememberance to the bride and groom on their wedding day without being overtly noticable to guests. We’ve even incorporated Iris and other flowers that have the same name as family members that have passed on as a memorial. Food: Recreating a family recipe or choosing a food favorite of the person you are remembering as one of the menu or dessert items can be a meaningful and lighthearted way to keep that person’s spirit alive at a wedding reception. Seeing “Grandma Sylvia’s Corn Fritters” or “Mom’s Favorite Tuscan Chicken” on the menu is something that will bring a smile to the family’s face when they sit down to dinner. We’ve even done a “donut tribute” to a passed father who LOVED chocolate and peanut butter! We knew he would approve! 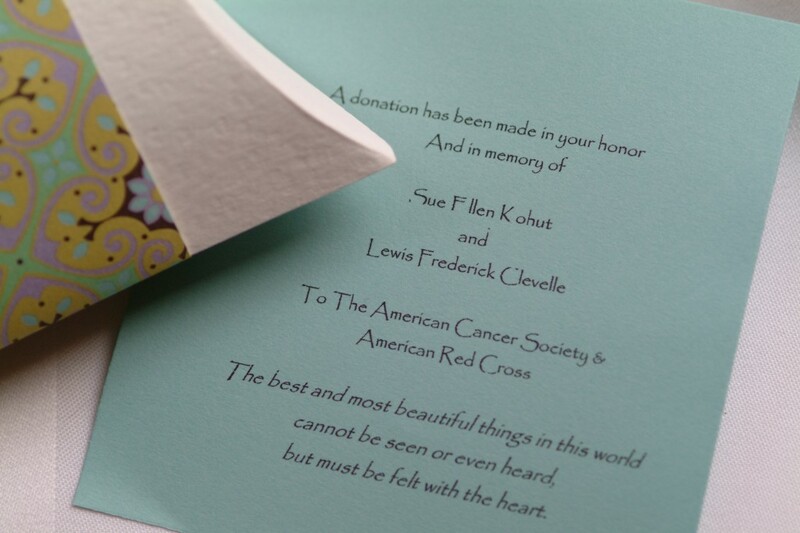 Favors: Making a donation to a charity that would be a proud representation of a family member that has passed on is not only a meaningful way to remember them, but pays forward your good will to others in need. Attire: Bride’s usually want to select their own wedding gown, but some of my favorite tributes involve wedding attire. Taking a part of Grandma’s wedding gown and weaving it into your underpinnings, garter or bouquet handle are a lovely and meaningful “something old,” and using Grandfather’s pocket watch or hankie add to a groom’s wedding attire. A piece of heirloom jewelry or a locket with a photo on your bouquet handle also keeps that person’s memory close to heart on the big day. My personal favorite – recreating Mom’s bridal headpiece for a bride a few weeks ago. Whatever you do, make it a joyful and meaningful rememberance that fills your heart with warm and positive memories.